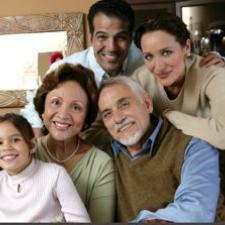 Hearing loss can be inherited from one or both parents who may or may not experience hearing loss themselves. Estimates predict nearly half of those with hearing loss have genetically inherited it. Genetic hearing loss can be present at birth or can show up later in life in one or both ears. Hearing loss that is inherited varies in severity from total hearing loss, deafness, to mild hearing loss and can be associated with other physical conditions. Genetic hearing loss, like non-genetic hearing loss, can be one of three types—conductive, sensorineural, and mixed. Sensorineural occurs when their is damage to the inner ear. Conductive hearing loss means there is damage to the outer or middle ear. Mixed hearing loss is a combination of the two or damage to the inner, and outer or middle ear. There are numerous reasons that hearing problems, defined by these categories, occurs and can result in hearing loss being temporary or permanent, mild to severe. Often times genetic hearing loss is present at birth and can be tied to other conditions as a person ages. An example of genetic hearing loss that can have consequences as a person ages is Pendred syndrome. Pendred syndrome is a genetic disorder that causes sensorineural hearing loss and can cause an enlargement of the goiter and hypothyroidism. Pendred syndrome is the most common syndromic hearing loss. Syndromic hearing loss is a fancy way of saying hearing loss that has signs and symptoms that affect other parts of the body. Before the slew of studies indicating that hearing loss left untreated had consequences for the mind, balance, and a host of emotional and physical complications, the genetic fallout of Pendred syndrome were already well known. The syndrome is named after Vaughan Pendred, a physician who first recognized the disorder. Today, as connections to good hearing health and good overall health continue to grow, scientists also try to discover the way consequences on the body from genetic hearing mutations can be minimized. Treatment for genetic hearing loss is very much like treatment for other types of hearing loss. An individual is diagnosed and tested by a certified audiologist. Once the degree and type of hearing loss is established, the patient and doctor discuss the best options for hearing improvement.